Peperomia are wonderful plants to grow indoors as they have so many features that make them ideal houseplants. With a great variety of beautiful foliage, and tolerating a wide range of growing conditions, they are ideal for anyone looking to expand their collection of houseplants. How Do You Take Care Of A Peperomia Plant? 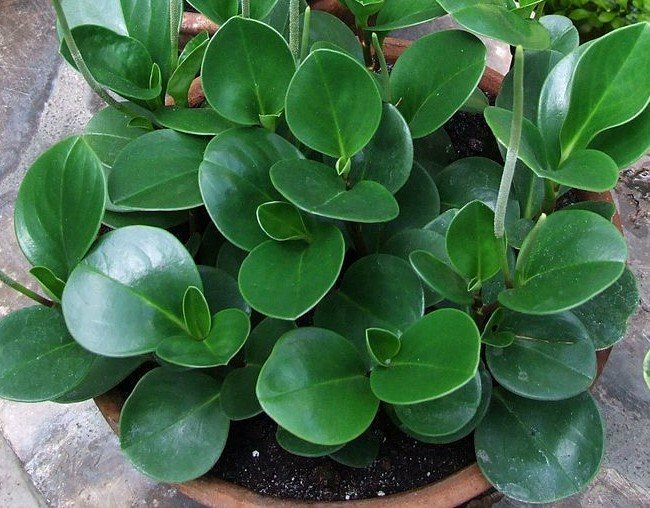 Most peperomia plants should be kept in bright, indirect sunlight, in temperatures of between 65-80 °F. They should be watered infrequently once the top inch of soil has dried out, fertilized monthly through the growing season and potted in well draining potting soil. Read on to learn everything you need to know to keep peperomia plants happy and healthy. Peperomia are native to tropical and subtropical regions of the world, in particular Central America. Most are compact perennial plants which are grown for their ornamental foliage, rather than their flowers, which are quite unimpressive. There is considerable variation in the appearance of peperomia plants, and this is one of the really interesting things about them. You could build up quite a sizeable collection of Peperomia plants, and still have no two plants that look quite alike. Peperomia plants are normally compact, rarely growing more than 12 inches in height in the indoor setting, making them ideal for containers, balconies or small indoor spaces. They normally have sturdy stems and many have fleshy leaves, with succulent characteristics. Although there are so many species of peperomia plant, they all tend to be small and slow growing, with most growing no higher than 1 foot (30 cm) and only a few growing up to 2 feet (60cm). There are bushy and trailing varieties, but the mature spread of most peperomia is only approximately 8-12 inches (20-30 cm). For this reason, they make ideal houseplants for small spaces and only need repotted infrequently. How Often Do You Water A Peperomia? You should water a peperomia plant once the top 1-2 inches of the soil dries completely and then water the plant thoroughly. Watering peperomia plants is the point when things most commonly go wrong. Overwatering is the number one problem that people have when keeping peperomia plants indoors. Many of us have a tendency to kill out houseplants with kindness by being a little too enthusiastic with the watering can. Signs of overwatering of peperomia plants can be rotting stalks, wilting or yellowing leaves, a heavy pot and waterlogged soil. I typically only water my peperomia plants every 7-10 days, but I’m always guided by the dryness of the soil, rather than the time since they were last watered. Peperomia plants will do best in bright, indirect sunlight. An east or west facing window sill is ideal for them at most times of the year. 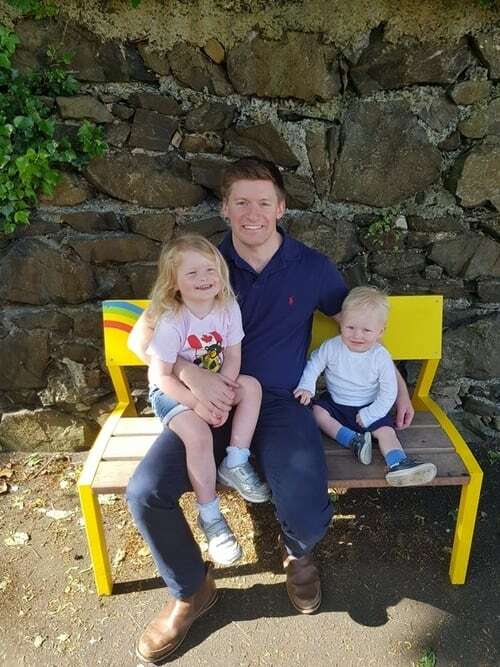 The only thing to watch for is to ensure they don’t get excessive direct sunlight during the summer months, as this can cause leaf scorching. If you place your peperomia plant somewhere it is getting insufficient light, it will tend to become leggy as it stretches towards the available light. If this happens, you can easily prune it back to retain the compact appearance of the plant. Just be sure to move the plant to a more appropriate location if this happens. Although they have a reputation for requiring high humidity levels, this is not the case for the majority of varieties. Many peperomia have succulent characteristics to their leaves, and can therefore tolerate low humidity levels and infrequent watering. This makes them an ideal houseplant, where the humidity levels of many indoor spaces is relatively low. Obviously, the humidity needs will vary depending on the variety of peperomia plant you own. The best guide is to look at the leaves, and the thicker and more succulent the leaves appear, the lower humidity levels the plant will tolerate. Bearing in mind that overwatering is one of the problems to avoid, a well draining potting mix is essential for peperomia plants. An equal mix of peat moss and perlite or coarse sand is usually a good option. Most Peperomia plants don’t need repotted too often, and typically do better in pots that are a little on the small side, so feel free to keep your peperomia plant in it’s existing pot, as you are unlikely to be causing it much harm. It’s generally a good idea to repot Peperomia plants every 2-3 years to prevent the potting mix from becoming too compacted, which will reduce drainage over time. You can repot your Peperomia in a similar sized pot, or one a little bigger if you wish. Pre-prepare your new pot with a suitable potting mix as outlined above. Add half the new potting mix to the pot and keep the other half to the side. Gently remove the Peperomia from its current pot and carefully separate as much of the old potting mix from around the roots as possible. Carefully transfer the plant into the new pot and then start adding the remainder of the potting mix around the plant. Firm the potting mix gently around the roots, but don’t compact it too much. Finally, water the plant thoroughly to ensure the plant settles into its new home nicely. 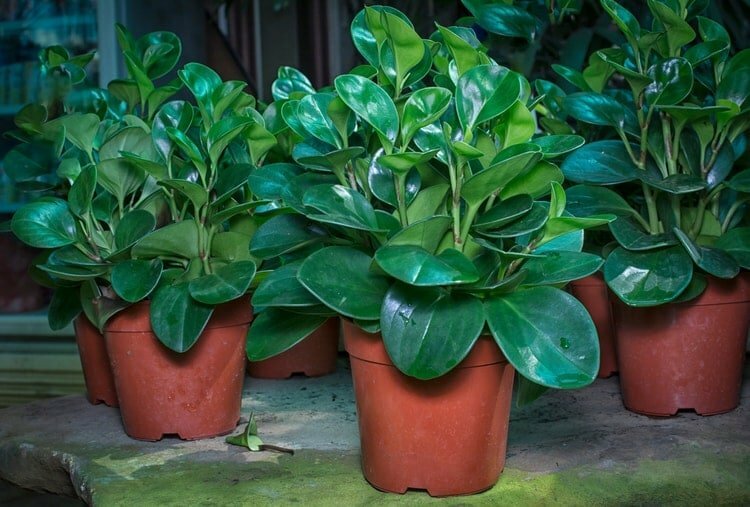 Peperomia species have very light fertilizing requirements and you are more likely to have problems if your fertilize too often compared to fertilizing too infrequently. I tend to use a balanced 10-10-10 water soluble fertilizer once per month during the growing season for my peperomia plants. You need to be fairly careful not to over fertilize peperomia plants, as this can cause a combination of problems resulting in toxicity of some nutrients and deficiency of others, which will lead to your plant becoming very unhappy. 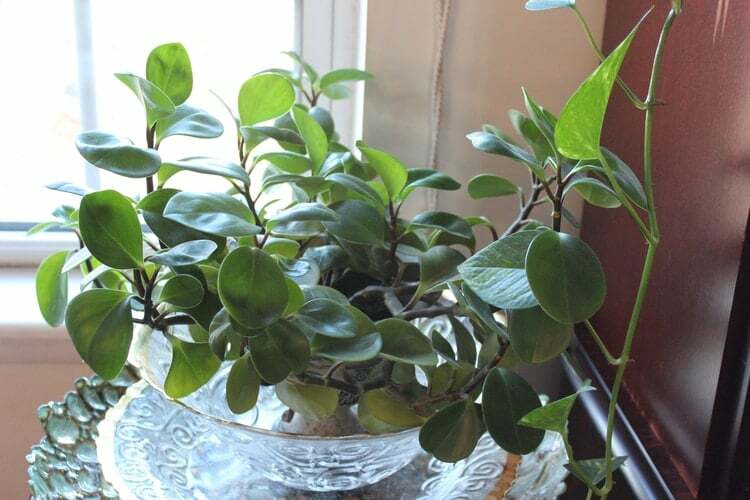 How Do You Prune Peperomia? There’s no need to be too delicate when it comes to pruning peperomia plants. They tolerate pruning really well, so don’t hold back. One of the reasons I love peperomia plants is their delicate, compact appearance, so I’m usually fairly aggressive in pruning mine back to keep their ornamental appearance. Other than for cosmetic purposes, you should also take the opportunity to remove any dead growth and leaves that show signs of damage or disease. Detecting unhealthy foliage early, removing it and preventing recurrence of the problem is an important way to keep your plant healthy. Propagating Peperomia plants is really easy, and it’s a great way to expand your collection of plants or share your lovely plants with friends and relatives. There are two main ways for propagating peperomia plants – Leaf cuttings and stem cuttings. The method you use will depend on the species of peperomia you have and on your individual preference. One point to note, is that variegated varieties of peperomia are better propagated by stem cutting as this will more reliably maintain the leaf variegation. Prepare your propagation tray or plant pots ahead of schedule. Use an equal mix of potting compost and perlite. 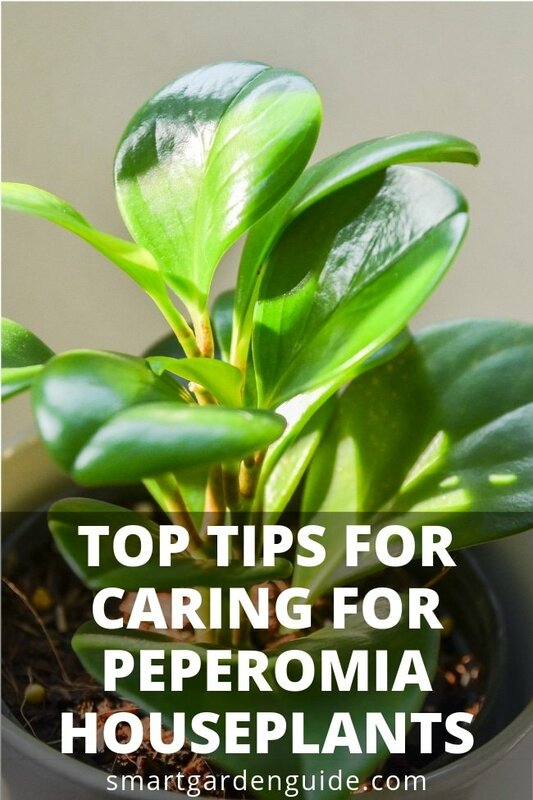 Ensure your propagation tray and all equipment you use are clean, and ideally sterile, as fungal disease is the biggest issue which can prevent your success in propagating Peperomia. Cut a healthy leaf off the plant. You can take this off at the base of the stem, or with a little stem attached. Use a sterile pair of sharp scissors or pruning shears for this. You can use whole leaves for propagation, but I recommend cutting the leaf in two across the width of the leaf. Dip cut edges of the leaf into rooting powder. This will encourage new roots to grow. Make a small channel in the potting media with a knife or spoon, so you can easily insert your leaf cutting 1-2 cm into the potting mix. Insert the cutting with the cut edge of the leaf down into the soil and firm the potting soil around the cutting. Thoroughly water the potting media. Cover the cuttings. Either use a covered propagation tray, or you can improvise with the use of polythene bag over the top of the plant pot. You should leave the propagating plants in bright indirect light at normal indoor room temperature. Remove the cover for a few hours every few days to prevent the build-up of excessive humidity which carries a risk of fungal disease. The first thing you may notice, is the development of new roots from the cut edge of the leaf. Following this, you will see a new shoot and eventually leaves start to develop. Once the plants are growing vibrantly and have developed several new sets of leaves, they can be potted up in individual pots. Don’t feel the need to pot your new plants up too quickly, as peperomias tend to have shallow root structures, and will not be overly restricted in a propagation tray for some time. This is ideally done in the spring when new growth will be most vibrant. Here is a step by step guide to taking a potting a stem cutting for a peperomia plant. Cut a healthy stem off the plant, ideally with three pairs of leaves on it. Use a sterile pair of sharp scissors or pruning shears for this. Remove the bottom pair of leaves, so there is a short section of stem exposed. Dip cut end into rooting powder. Peperomia plants aren’t really known for their flowers, as they are fairly unimpressive, resembling a bushy spike or tail. Some species will have fairly prominent flower spikes, while others are barely noticeable. The real attraction of these plants is the fantastic foliage, which more than makes up for the lacklustre flowering display. Thankfully peperomia plants are entirely safe for humans and pets. There is no danger to your pets from contact or ingestion. Whilst I’m sure they don’t taste very nice, you needn’t worry if your pet takes a liking to having the odd nibble of a leaf here and there. Equally, it’s reassuring for those people with small children who can safely place peperomia plants anywhere in their home without wondering whether there is a risk to their children’s health. When buying a Peperomia, you want to ensure that you are taking home a healthy plant, so here are a few handy tips. 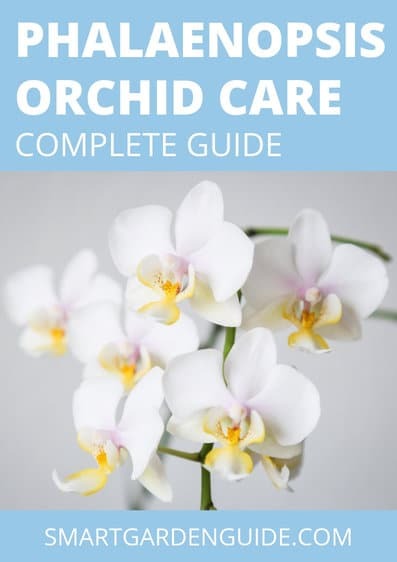 Firstly, try to buy from a reputable nursery or garden centre. Peperomia plants are a bit sensitive to low temperatures, so improper transport or storage could really damage the plant. If a plant has only recently been subjected to improper conditions, the damage may have been done but it may not yet be apparent in the appearance of the plant. Check the leaves for black spots, yellowing, wilting or signs of physical damage. Make sure to have a look at both the front and back of the leaves to look for fungal disease and pests. You may wish to ask the staff in the store how long the plants have been in stock and what conditions they have been kept in. Any reputable retailer should be able to tell you exactly how they have been cared for as well as the logistics process for getting them from the grower to the store. Many, but not all species of peperomia plants have succulent characteristics. This means that they have certain adaptations to help them store water or reduce water loss, to help them cope with infrequent watering or arid conditions. Succulents are not a strictly defined category of plants, but more a series of adaptations, which plants from multiple genera will exhibit. There are certain plants which are most definitely regarded as succulents, and others, such as many peperomia,which exhibit varying degrees of succulence. Some examples of Peperomia with succulent adaptations are Peperomia dolabriformis, Peperomia rotundifolia and Peperomia graveolens. Why Is My Peperomia Wilting? Peperomia plants will wilt for two main reasons. The first is over-watering and the second is under-watering. Under-watering seems like an obvious cause of wilting, but over-watering is a bit more surprising. The reason for this is that in both scenarios the plant is not getting enough water. An under-watered plant will have wrinkled, dry, wilting leaves and there may be crispy tips to the leaves. The soil will be very dry to touch and when you poke a finger deeper down, it will be dry right to the bottom. The roots simple don’t have access to the water, so the solution is simply to water the plant and monitor the soil moisture levels. In the case of overwatering, this is a much more serious problem. Overwatering can cause root rot, which kills the roots. If the roots die, the plant is also unable to take up the water in the soil which is present in abundance. Once you feel the soil, it should be obvious that overwatering is the problem. This needs immediate attention, and even then, you may not successfully be able to revive your plant. If the problem isn’t too severe, simply stop watering the plant and let it dry out. Remove any foliage which is too badly damaged and ensure to water sparingly from this point. If, however, the plant is wilting badly, you should repot it. First trim any badly damaged foliage from the plant. Next, remove the plant carefully from the pot. Try to separate as much of the wet, waterlogged soil from the roots as possible. Assess the roots, and determine which are healthy and which are diseased with root rot. You need to remove the diseased roots with a sterile pair of scissors to prevent the root rot from spreading. Once all of the diseased roots have been removed, repot the plant in new potting mix with equal quantities of potting compost and perlite. Once repotted, only water the plant very lightly and leave it for at least a week before watering again. From this point, be guided by the feel of the soil to determine whether watering is required. Poke your finger into the soil every few days and only water the plant once the top 1-2 inches of the soil is completely dry. Hopefully your plant lives to fight another day. Why Is My Peperomia Dropping Leaves? Leaf drop can either be a sign of the normal growth pattern of a peperomia plant or is can be a sign of problems. As a peperomia plant develops new foliage, it will often shed some of the lower, older leaves, to focus energy on the new foliage. This is entirely normal and nothing to worry about. If, however, your plant is dropping multiple leaves from different areas of the plant, it can be a sign of more major problems. If you have just purchased your plant, it may be a sign that the plant was improperly cared for at the store or in transit. If this is the case, all you can do is try to optimize care now and hope that in time the plant recovers. Dropping leaves can also be a sign of overwatering, so bear this in mind and check the soil regularly to assess when watering is required. Although not very prone to disease, leaf drop can be a sign of infestation or disease, so take time to carefully examine the front and back of the leaves on your plant. If you identify any problems, you should deal with them quickly. I’ll discuss how to identify and fix diseases and pests later in this article. What Causes A Peperomia To Have Yellow Leaves? 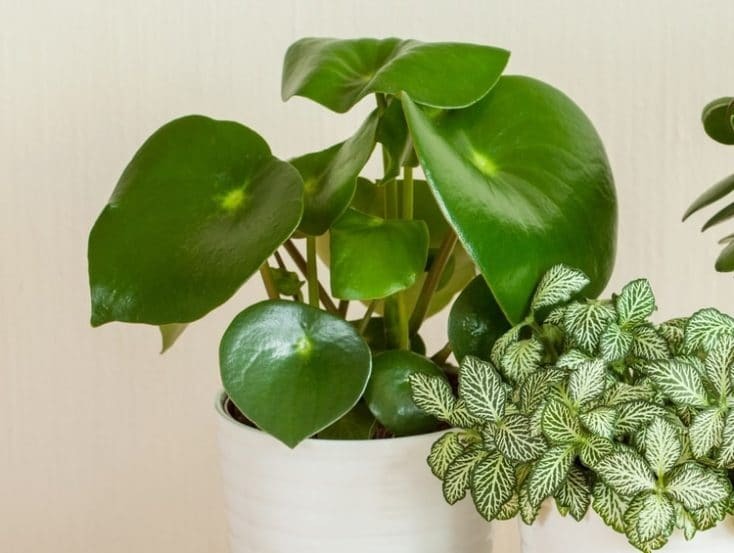 There are multiple causes of a peperomia plant having yellow leaves, including improper watering, excessive sunlight, or as a reaction to a sudden change in positioning or temperature. One major cause of yellowing leaves on your peperomia plant is excessive sunlight. Whilst peperomia plants will do will in bright, indirect sunlight, they don’t react well to prolonged, direct sunlight. In their natural habitat, peperomia plants are found under the canopy of tropical and subtropical forests, as as a result, they don’t get much direct sunlight, although they do like warm environments. Yellowing of leaves due to excessive direct sunlight can take a number of forms. The leaves can appear generally faded, with homogeneous yellowing of the leaves. Sometimes you can have burnt patches on the leaves, particularly at the leaf tips and edges. It’s just really important to think about this as a potential cause. It should be fairly obvious and easy to fix. If you notice that your peperomia plant is getting a lot of direct sunlight during the day, or if you have it placed near a south facing window, it’s time to move it to an alternate location. The other really important cause of yellowed leaves, is overwatering, which as you now know, is the biggest problem for peperomia care generally. Use the methods we talked about above to determine whether your plant is being over or under watered and correct this as appropriate. Why Are My Peperomia Leaves Curling? This is a bit more unusual, but is usually caused by bugs or nutrient deficiency. First inspect your plant to check for infestations, particularly mealy buys, which will appear as cotton white masses on the undersides of leaves or on the stems. If you find any bugs, you can use an insecticidal soap to try to eradicate these pests. Alternatively, if your leaves and stems look good, you should think about nutrients. Calcium deficiency is a known cause of curling leaves in peperomia plants. This can be caused by over-watering in an acidic growth medium such as peat. High acidity reduces the availability of calcium in the soil, preventing the plant from absorbing it. Alternatively, applying excessive nitrogen or phosphorus to your peperomia can prevent the plant from absorbing calcium and thus present with the characteristic leaf curling of calcium deficiency. Why Is My Peperomia Dying? If you’re not too sure why your peperomia plant is dying, think water and light. Get these elements of peperomia care right, and you’re well on the way to keeping your plant alive. Peperomia plants tend to be fairly hardy to disease, but there are a few bacterial and fungal diseases to look out for. The most common disease to afflict peperomia plants is Pythium, which causes stem and root rot. This is probably the most serious disease that peperomia encounter and can very quickly cause the death of a previously healthy plant. Pythium is an opportunistic fungal infection which thrives in the anaerobic conditions of waterlogged soil. This is why overwatering peperomia is so important to avoid. Pythium can be at quite an advanced stage before symptoms develop, as it usually starts in the roots of the plant. You may notice black or oedematous spots of patches forming on the stems of the plant, but by this stage, it is often too late. The first sign of a problem is normally the plant drooping, wilting or just generally looking pretty unhappy. You can identify Pythium by detecting waterlogged soil and then inspecting the roots. The affected roots will be soggy and delicate and must be removed if the plant is to survive. Aggressively pruning the affected parts of the roots and plant and repotting with new pot and potting mix is the best hope of rescuing the plant. What Causes My Peperomia To Have Black Spots On The Leaves? Black or brown spots on the leaves of a Peperomia plant is something that should be given immediate attention. The most likely problem is infectious leaf spot diseases, such as Cercospora leaf spot, Phyllosticta leaf spot or Rhizoctonia leaf spot. The remedy is to immediately isolate the plant from other plants in the area and remove the infected portions of the plant. It is best to remove entire leaves and prune the plant fairly aggressively to ensure that all areas of disease are removed. Ensure to use sterile scissors or pruning shears to remove the diseased foliage. Peperomia are fairly resilient to pests, but can still be commonly affected by fungus gnats, mites and mealybugs. Fungus gnats are little black flies and will be noticed in the soil. Damage to the plant is done by the larvae, which feed on the roots of the plant. The adults don’t actually directly damage the plant. Reducing watering and top-dressing the potting mix with sand should help to control them. Alternatively, adding a small amount of cinnamon powder to the top of your soil is a great option and works well. Mealybugs are detected as white masses on the lower surfaces of the leaves and on the roots. Mold is also present alongside mealybugs. Infected plants will have their growth stunted. Treatment should be with an insecticidal soap or spray or you could try neem oil. Mites are usually very tiny and can be undetected for a long time, often until significant damage has already been done to your plant. Mites can cause necrotic areas on the leaves and stunting of new growth. Control should be with full coverage of the plant with a pesticidal soap or spray. With dozens of Peperomia species grown as houseplants, I’m only scratching the surface, but here are a few of the most popular species. Peperomia argyreia and Peperomia sandersii – Watermelon Peperomia is a very popular variety due to the distinctive characteristics of the foliage, which resemble the appearance of a watermelon. They have dark green leaves and silvery stripes travelling from the centre of the leaves in curving lines towards the leaf tips. The leaves are held by individual petioles, which are often reddish in color. 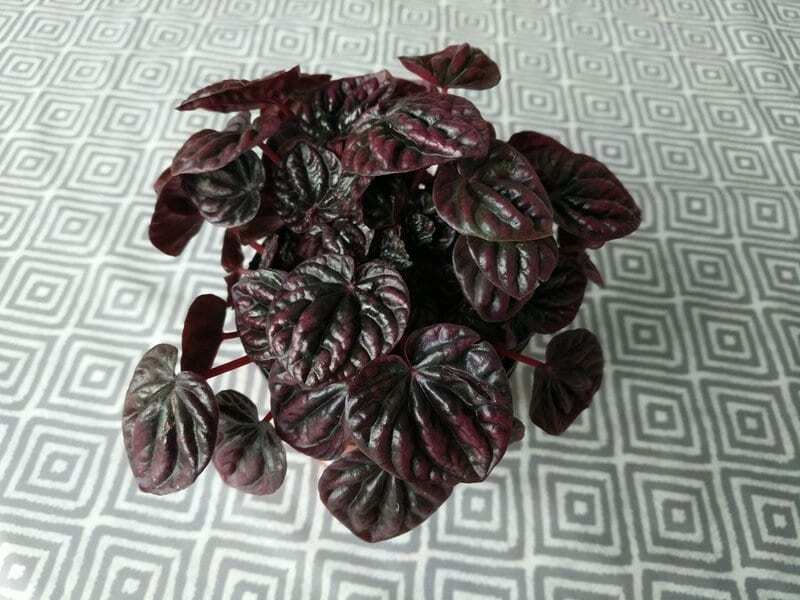 Peperomia caperata – Emerald Ripple Peperomia has a rosette appearance to its foliage and very dark green, red or purple leaves. The leaves have deep creases along their length, making the leaves look deeply textured, as if wrinkled. 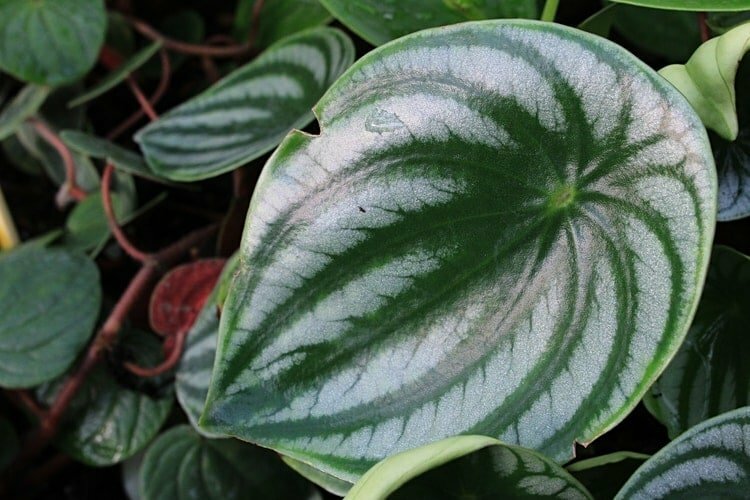 This tends to be a particularly compact peperomia species, ideal for growth in a window container or terrarium. One of my absolute favorite peperomia species that I would highly recommend. Peperomia scandens (Cupid Peperomia or False-Philodendron Peperomia) – This is a low growing, trailing variety of peperomia. It has light green, heart-shaped leaves, with a thin white or pale yellow border. A really good option to spill over the side of a planter or to hang down from a hanging basket. 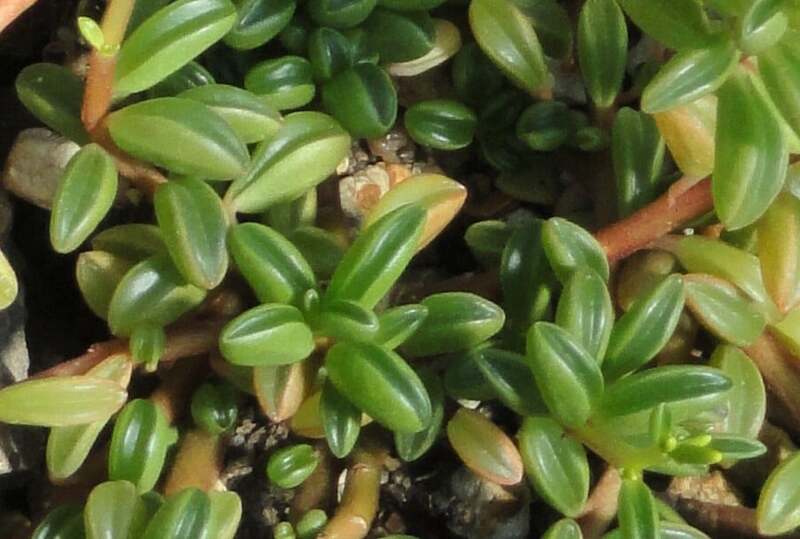 Peperomia nivalis – This is a diminutive, creeping peperomia species, which has pronounced succulent characteristics. It has thick, light green, fleshy leaves, which have an unusual folded shape. 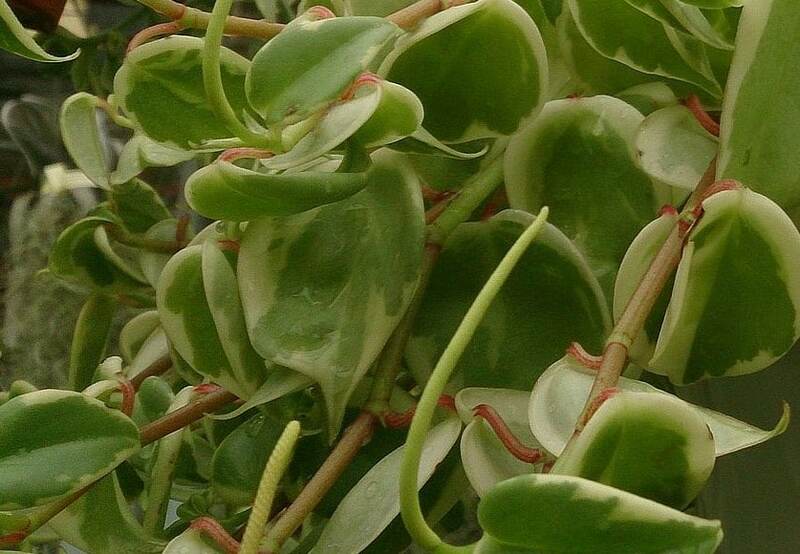 This is a feature that is present in a number of peperomia species, including the Peperomia graveolens, where the underside of the leaf is red and curves upwards, creating a striped appearance.